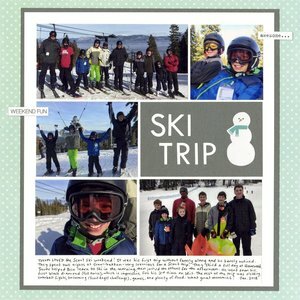 Trevor's Boy Scout troop went on a ski trip in January and had a blast. It was the first trip he'd done without Steve or me along, so we really treasured the photos that the leaders sent to us. In every picture, it was clear Trevor was having the time of his life. The day after he got home, he blogged about the ski trip and all the fun he had. I only had a few photos to choose from to scrap the trip, but I am so grateful for those. I'm especially happy for the group shots. My favorite photo is the one with the four boys lifting their poles after conquering the black diamond run. I'm so proud of Trevor for keeping up with the older scouts and challenging himself! Love love love this! LOVING the photos and the snowman!!!!! !